BLACK Flesh Tunnels and Plugs ❘ order now! On the one hand black is the colour of mystery and protection. But black is also perfectly suitable to express understatement and coolness. As this black piercing jewelry will fit to any kind of clothing that you have in your cupboard it makes dressing yourself in a stylish way very easy. Just put on your favourite clothes and you are done. You don´t need to worry about if the colours of your jewelry will match to your clothing. It is black. Black matches to everything else. Although black is such an easy to wear colour it will never be a boring one. There are so many different materials piercing jewelry can be made of and all these materials have a different texture of their surface and also look differently. Just change them as often as you like or wear continiously the same jewelry. Black will always be a good choice. No matter if you prefer classic flesh tunnels or tunnels gemmed with crystals, the darkest one of all colours will always be a good choice. You are also spoiled for choice regarding to the material the tunnels consist of. The black silicone or acrylic tunnels are very lightweight and favourable. Steel tunnels on the other hand are very robust and massive. Black titanium tunnels even combine both characteristics. They are very lightweight but also sturdy. That´s why titanium is often used in the field of aerospace. It is a high-tech material perfectly suitable for any kind of piercing jewelry. If you prefer natural materials we also offer tunnels made of beautiful black maple wood. Tunnels or plugs - thats always a good question. 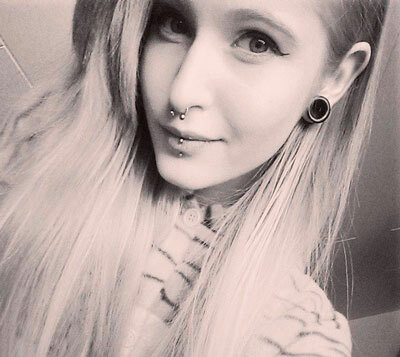 Many people sometimes wear plugs and sometimes tunnels. Therefore we have a large product range of black flesh tunnels and plugs. You can buy tunnel plugs that have a stylish, matt surface one the one hand and if you prefer things glossy you can also get glittering black flesh tunnels in our shop. Plugs offer more space for decorations and motives on the piece of jewelry itself. You can buy black plugs gemmed with big rhinestones, funny or individual motifs and also a combination of both in our shop. If you like very special shapes of tunnel-plugs instead of the ordinary round ones we also sell triangular, square and heart-shaped plugs.